After graduating from film school at the University of Miami, Jordan moved to Hollywood, California where he worked at a movie production company and a Beverly Hills talent agency as an agent’s assistant. These experiences – combined with working at a modeling agency in South Beach plus CNN and Turner Entertainment’s public relations departments – provided him with insider knowledge on the best ways to contact celebrities and get past their gatekeepers. For over 20 years, Contact Any Celebrity’s team has cultivated personal relationships with celebrity assistants, agents, managers, and publicists granting its Members unprecedented access to 59,000+ highly sought celebrity contacts worldwide. Today, Contact Any Celebrity’s lightning-fast, Private Online Database uses Dynamic Lookup Technology to provide its Members with the verified mailing address, agent, manager, publicist, production company, and charitable cause for 59,000+ celebrities worldwide, plus the phone, fax, and email addresses for 13,000+ celebrity representatives and 7,000+ entertainment companies. Contact Any Celebrity has been featured and recommended by ABC News, CBS News, CNN (Video Interview), American Express OPEN Forum (5 Secrets to Getting Celebrity Love for Your Products; 7 Easy Ways to Sell More and How to Attract Celebrities to Your Product), Entrepreneur Magazine, Forbes, FOX News (How to Befriend the Famous), New York Daily News, Investor’s Business Daily, Tim Ferris’ The 4-Hour Workweek, Daily Record UK, Guardian UK, Star Magazine, E! Online, Alloy, American Writers & Artists Inc. (AWAI), Clarity.FM, Jezebel Magazine, Look to the Stars, Bottom Line/Personal, Dan Kennedy’s No B.S. Marketing Letter, GKIC Small Business Hour, Bill & Steve Harrison’s Book Marketing Update, Bill Stoller’s Publicity Insider, Dan Schawbel’s Personal Branding, Small Business Rainmaker, Brilliant Business Moms, Bulldog Reporter, Business of WE (Women Entrepreneurs), Career Trend, Classwish, DevTribe, GlobalCrafts.org, Indie by Nature, John Kremer’s BookMarket, Launch Grow Joy (Review), O’Dwyer’s PR, OC Register, Pam Perry’s PR Coach, Publicity Hound, RetroMedia NYC, Rich Mom Business, Inside Business, Mogul Mom, The Post & Courier, Reference.com, RetroMedia NYC, Sandra Beckwith’s Build Book Buzz, Sarah Shaw’s Street Smart MBA, Scott Fox’s Click Millionaires, Startups.co, Stu Heinecke’s Contact Marketing Radio, Target Marketing Magazine and more. The service is also recommended in several bestselling books including Tim Ferris’ The 4-Hour Workweek (Chapter 9 – The Comfort Challenge) plus The 4-Hour Workweek: Expanded & Updated; Dan Kennedy’s No B.S. Marketing to the Affluent and Celebrity Promotions Swipe File; Dan Kennedy, Bill Glazer and Lee Milteer’s Secrets of Peak Performers; Dan Poynter’s Book Publishing Encyclopedia & Writing Nonfiction; Entrepreneur Magazine’s Public Relations Made Easy; Marcia Yudkin’s 6 Steps to Free Publicity; Robert Skrob’s Official Get Rich Guide to Information Marketing; Christina Daves’ PR for Anyone; Marcia Yudkin’s 6 Steps to Free Publicity; Robin Blakely’s PR Therapy; Tsufit’s Step Into the Spotlight! 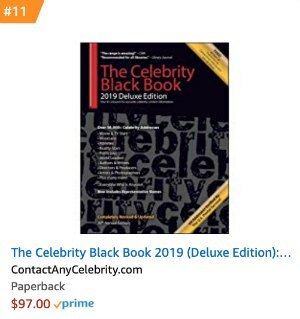 ; and John Kremer’s 1001 Ways to Market Your Books (including a chapter by Jordan on how to get celebrity book endorsements). Jordan is the author of the bestselling Celebrity Black Book: Over 50,000 Celebrity Addresses; Secrets to Contacting Celebrities: 101 Ways to Reach the Rich & Famous; Celebrity Leverage: Insider Secrets to Getting Celebrity Endorsements, Instant Credibility & Star-Powered Publicity; Help from Hollywood: How to Hold a Celebrity Autograph Auction and The Lost Secrets of Fame & Fortune: How to Get – and Keep – Everything You Desire (available at Amazon & Barnes & Noble). He is a member of the Public Relations Society of America (PRSA), Association of Fundraising Professionals (AFP), Independent Book Publishers Association (IBPA), Information Marketing Association (IMA) and GLAAD Media Circle. Follow Contact Any Celebrity on Facebook, Instagram, and Twitter. Find Jordan on Amazon, Barnes & Noble, Facebook, Instagram, LinkedIn, Snapchat (jmcauley77) and Twitter.